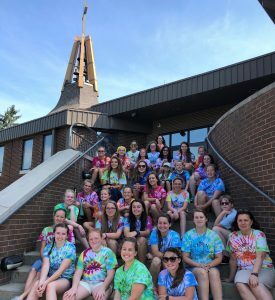 This past summer, the St. Michael’s Challenge Girls Club of Indiana sponsored yet another Girls Getaway Event from July 9-12th, 2018 at the Our Lady of the Apostles Family Center near Greenfield, IN. Girls Getaway is a service-driven camp, a little different than most summer camps. Each day, the participants ventured out to one or more missions, keeping in mind that they are being Jesus to the many people that they meet. In addition to the mission outings, talks, daily Mass, Holy Hour, a pool party, and skits were other much anticipated components of the camp. This year, confession was even held in a cubicle at the Gleaners Food Distribution Center. This event could not have happened without the help of many people who deserve our gratitude. We are thankful for Father Aaron’s blessing, moms’ planning; sponsorship; 2 donated buses and 2 volunteer bus drivers; spiritual direction of Fr. Louis, Fr. Kevin, Jacque Lustig, and Lorianne MacDonnell; St. Michael’s Women’s Group for food donations; those that prepped meals and laundered tie-dye shirts; and most importantly, thanks to God for His presence throughout the week and for making all of the pieces fall into place! 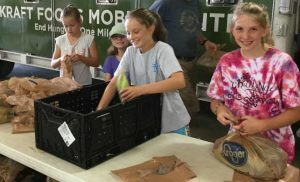 These people allowed Girls Getaway to serve as Christ to 3 Gleaners Mobile Food Pantries, Gleaners Food Distribution Center, Merciful Help Center’s “Tools for School”, St. Augustine Home and St. Vincent de Paul Food Pantry.